WordPreSt adds a reStructuredText input mode to the WordPress post/page editor. Once installed, reStructuredText may be input directly into the editor and converted to HTML with the click of a mouse. The reSt source is saved with each post/page for future edits. The rendered HTML output is stored as the actual post content to allow modification after rendering if desired. Plugin settings control the features of the reSt convertor and include automatic table of contents links, post title generation from reSt, header level customization, and others. A “View document source” link is also (optionally) available for each post. WordPreSt requires no template modifications and every effort has been made to ensure a truly seamless integration into WordPress. Why Not Just Use Markdown? How do I install Docutils? This is awesome! Can I Give You Some Money? Install Docutils on your WordPress hosting server. Download the latest stable WordPreSt release from the GitHub page. Unzip the plugin package into the /wp-content/plugins/ directory. The zip file will automatically extract into a wordprest subdirectory. 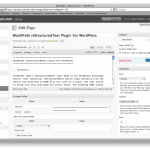 Activate the plugin through the “Plugins” admin menu in WordPress. Configure the WordPreSt settings (in the “Settings” admin menu) and provide an absolute path to the Docutils rst2html.py script. WordPreSt does its best to locate the script automatically, but often requires manual configuration. Markdown is a great text format (and conversion tool) and I’m a huge Gruber fan and all, but it’s really quite limited in the grand scheme of document management. Markdown is not multi-document aware, meaning it only knows about the one file it is parsing at a time, and lacks the ability to link between internal references across files. A few of its features are add-ons requiring plugins, which are not available in every implementation of Markdown either. It’s a generally less-configurable format as well, where reSt provides extensive optional settings for various elements. Perhaps most importantly though, reStructuredText has many output convertors allowing you to write once, parse a thousand times, into almost any conceivable format out there. If the output format you desire does not exist, it’s (fairly) trivial to create your own. Markdown is strictly an (X)HTML convertor which severely limits your options if you want to publish your documents across different media. If you have shell access to your hosting server, you may be able to simply run easy_install docutils. If easy_install is not available, you will need to download and install Docutils according to the instructions on the Docutils home page. Wow, I’m flattered! I’m also very broke, so that works out perfectly! Of course I’ll accept donations, and the guys over at GitHub have been nice enough to hook me up with a Pledgie account to make it incredibly easy for you to show your gratitude for my hard work. Any amount would be greatly appreciated. Without HTML auto-update enabled for a post, there is a very slim chance that changes to the reSt source will be lost if you navigate away from the editor. One solution would be to hook into WordPress’s own auto-save hook, which saves a draft version of your post. There will be some crazy post ID handling that will need to be done, but it appears that meta data can be saved to drafts as well, so it’s feasible that we could save the reSt with each auto-saved draft. A “load reSt from file” button would be super useful for folks like me who prefer composing posts in an offline editor. The file’s contents would have to be sent to the server and then passed back to the reSt editor and (optionally) rendered into the HTML editor. HTML conversion options should be configurable on a per-post basis, overriding the global options. The post specific options could be stored in an additional meta field. The reSt toolbar could use a few more tools to make it easier to insert some of the more configurable reSt directives, like images. Directives that require options or that have multiple presentation modes (links for example) will probably be handled through a pop up / modal box interface. WordPress has a few other places where posts can be inserted, like QuickPress, that should be optionally reStructuredText enabled. Pygments can be used for syntax highlighting if available, but the setup might be a little too complicated for beginners. Even though the irony there is really funny, it would be a good idea to add a couple of settings to handle which Pygments stylesheet to use, possibly on a per-post basis as well. A “custom” option would allow the user to provide his own Pygments CSS. Of course, WordPreSt should automatically determine whether or not to include the Pygments styles when displaying a post/page. Getting the absolute path of rst2html.py is definitely the main stumbling block for new installs. The settings screen should have a button to determine (via AJAX) whether or not the current setting is correct. WordPreSt automatically tries to locate the script upon activation, but the auto-locate feature could be useful from within the settings page as well. Docutils could probably be detected more accurately through a Python script, and if not found, an option to install through the settings page would be very helpful (if possible). Eventually it may even be possible to package a standalone Docutils package, requiring only the Python interpretor to work. Sometimes you just have to look up the syntax for a more rarely used reSt directive. A toolbar link to the Quick reStructuredText reference page would come in handy from time to time. 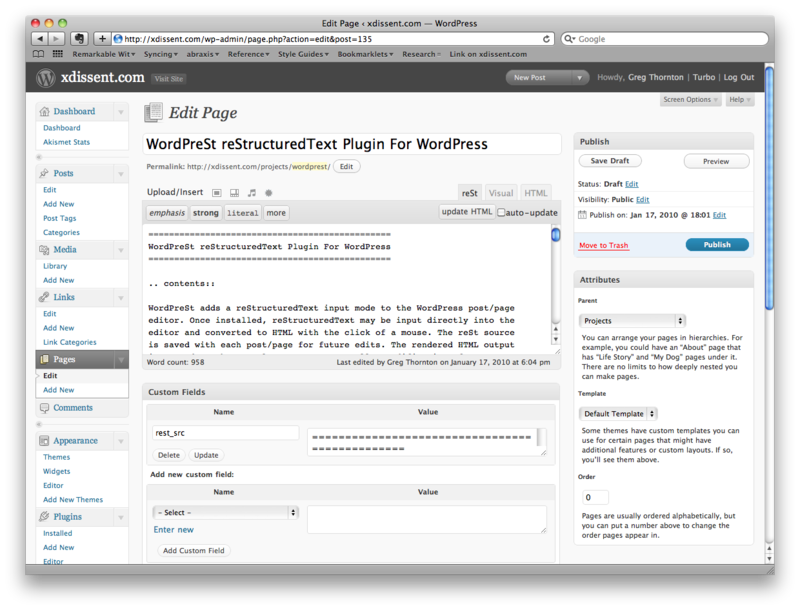 I just did a fresh install of wordpress 3.0.3 and wordprest 1.0. Yeah, it’s not compatible with WordPress 3.0 yet. I’ve got a modified version running on my site that works, but it needs some cleanup before release for sure. I’ve been very busy, plus the official WordPress plugin release process is really annoying, so I haven’t gotten around to tidying it up. I’ll try to devote some time this weekend to rolling out a new version. Sorry for the frustration! 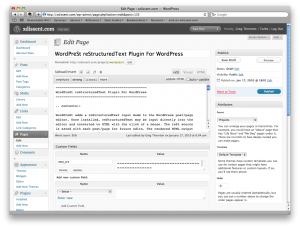 Any progress on the new Wordprest for WordPress 3.x ? Hope you can get it working for WordPress 3.x soon. What WP 3.0 compatibility takes? Currently I am running HTML thro rst2html.py by hand and then copy-pasting into WP source code view. Hi there, I’d like to see this working on WP 3.4. Are you likely to be doing any work on this in the forseeable future? I tried it and the rEst tab doesn’t appear in the editor at all. I guess they must have changed the hooks in the editor.